We are not accepting orders from individuals or dealers at this time. We are absolutely excited to introduce our new Mach2GTO Universal Robotic mount that sets a new standard for portable telescope mounts. It is so easy to use that you will be up and running in no time at all and the mount will simply disappear into the background. No fuss, no bother. Universal Robotic means that Mach2 fulfills all of the requirements of a robotic mount for automated operation for imaging, satellite tracking, comet tracking, star survey work and others. In addition, the clutches allow it to be used manually for star sweeping. It is so easy to use that it can be set up quickly in the field with minimal effort and no complicated startup routines. The encoders keep track of the axis positions at all times whether parked, unparked, power on or power off. Polar Align, Power Up and Go! We have developed a new control system which combines the precision performance of the Renishaw Absolute Encoders with the whisper-quiet motion of brushless micro-step servo motors to produce a very accurate observatory grade mount that can also be set up in just a few minutes in the field. The mount can be operated manually via the clutches or electronically with the encoder loop providing the pointing and tracking functions. Use of Absolute Encoders means that the mount always knows where the axes are pointing and don't need to establish home on power-up. The mount can be operated manually via the clutches or in full GoTo mode via keypad or external software. Absolute Encoders are dead accurate in slewing, pointing, tracking, guiding. Periodic error and backlash, reversal delays in Dec are eliminated. Rapid feed-forward servo loop stiffens the axes against outside disturbances such as cable drag and wind loading. Both axes can be run at custom tracking rates from sub-arc second motions per hour to 1000x sidereal. The GTOCP5 has modeling capability that is suited for quick setups in the field for portable operation. No computer needed. The GTOCP5 brushless servo system can be run from 12 volts to 24 volts with max slewing from 1200X (5 deg/sec) to 1800X (7.5 deg/sec). The power to the motors is self-limiting and cannot cause any kind of damage to the windings or the electronics, even when in a stalled state. The Keypad is a self-contained computer that allows you to control all essential telescope functions and includes an extensive database of objects. Many people do not want to bother with a computer in the field and like the handiness of the Keypad and its ability to operate in very cold temperatures. The Keypad is an ideal choice for these users. We have designed the interface and firmware to be as intuitive and easy to use as possible, while filling it with terrific features to make your observing session productive and pleasurable. 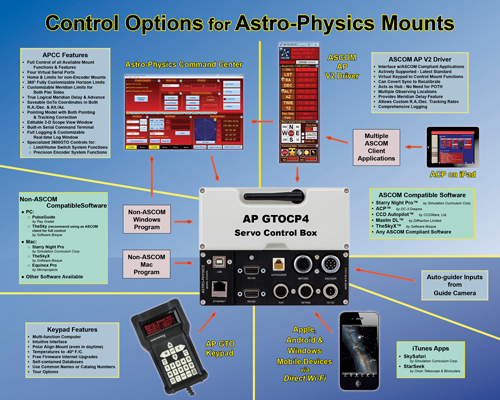 Astro-Physics mounts and the Astro-Physics GTO Servo Control System are designed from the outset as tools for celestial observing and imaging. These mounts do not have any military or defense applications. Applications like missile, airplane, or very low earth orbit satellite tracking require faster tracking rates and more rapid changes to those tracking rates than our mounts allow. Note that the ISS is generally within the mount’s tracking rate capabilities. All of our 1100GTO and 1600GTO mounts with Absolute Encoders have always used the Renishaw Resolute Absolute Encoders for precise positioning and tracking. Now our newest mount, the Mach2 has Renishaw encoders built-into every mount. What are the main differences between the Renishaw and other less expensive relative encoders? 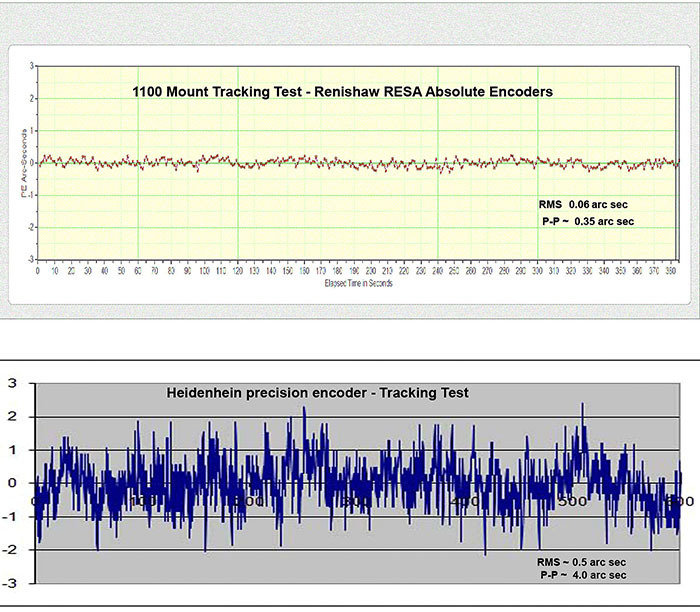 The Renishaw encoder accuracy is verified against a laboratory standard. Each ring comes certified with its own calibration measurement. The maximum guaranteed error on these rings translates to less than 1/2 arc second per hour tracking error. Highest Resolution for Unparalleled Tracking Accuracy! The Renishaw Resolute read-head interpolates a special barcode that is engraved on the matching stainless steel ring into 67 million individual addresses. Every address is unique and fully reproducible down to sub-arc second levels. This is not possible with any relative encoder system. Ripple and Resonances – NOT with Astro-Physics!! Relative encoders use a simple ring that has engraved marks with separations on the order of 60 to 100 arc seconds between ticks. In order to achieve sub-arc second resolution, the gaps between these marks are filled in electronically by a method known as interpolation. Even the best interpolation methods have errors on the order of 5% (3 to 5 arc seconds). When used in a telescope drive system these relative encoders introduce a fast moving ripple in the RA tracking rate of 3 to 5 arc seconds, although the average or RMS value of this error can be quite low. These peak excursions cause stars to move slightly back and forth in the RA direction during sidereal tracking. This tracking ripple can remain hidden when imaging with short wide-field scopes, but will manifest itself when using long focus instruments for high resolution work. It is generally a fast moving error, so it cannot be guided out. Because of the ever present interpolation error (SDE) with low cost relative encoders, we decided long ago that we would not use them. Renishaw absolute encoders use a different type of interpolation system that smooths out the SDE to a level that is not detectable. There is no mechanism for a relative encoder to remove the SDE. Never Needs Homing. Simply Polar Align; Power Up; and GO!! An absolute encoder never needs to be homed. It is always home the minute power is applied. It always knows where it is and transmits the exact shaft position to the control box at all times. We have used Renishaw encoders for many years on our larger mounts, both in portable setups and in observatory remote installations. They have been totally reliable. Renishaw encoders are also considered to be the gold standard in the machine tool and robotics industries where precision is required. Yes, they are much more expensive than a simple relative encoder, but for the type of accuracy required in a telescope mount, there is nothing out there that comes close. We know, we have been evaluating options for years. Finishing and Assembly Every part is hand-finished and inspected. All assembly is done by hand, by highly skilled mount assembly staff. Capacity Approximately 75 lb. (34 kg) scope and accessories only (maximum capacity depends on scope diameter). 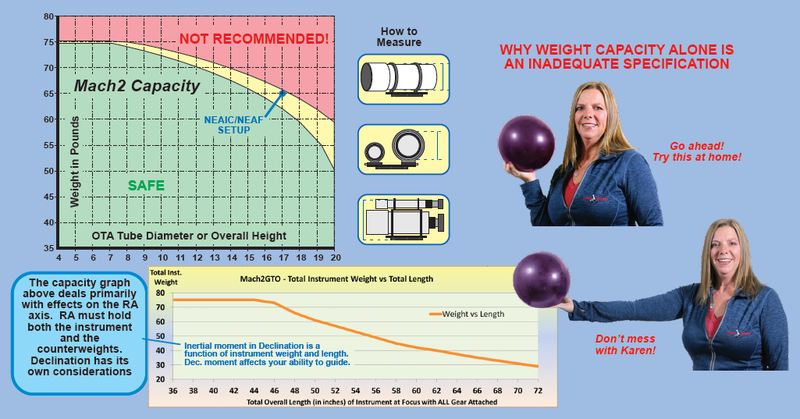 Refer to the graphic that discusses weight capacity calculation. Flexible Control with Your Keypad, Computer or even your Mobile Smart Device! As this chart shows, there are many options available for controlling your mount. Take a few minutes to link to descriptions of the varied software and devices that are available. You will be able to link to a full-sized view of this chart.